Prime Minister Justin Trudeau has fired Canada's ambassador to China, John McCallum. The detention of Meng Wanzhou, at the request of the US, angered China and soured Canada's relations with Beijing. Ms Meng, Huawei's chief financial officer, is accused by the US of evading sanctions on Iran. Both she and Huawei deny those allegations. 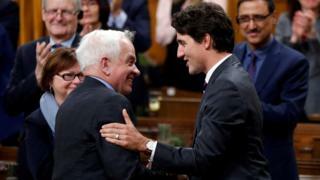 In a statement, the Canadian prime minister said: "Last night I asked for and accepted John McCallum's resignation as Canada's ambassador to China." What about the ambassador's remarks? The next day he issued a statement saying that he "misspoke" and regretted that his comments had created "confusion". But on Friday he was quoted as saying it would be "great for Canada" if the US dropped the request. Mr McCallum was appointed Canada's ambassador to China in 2017, stepping down as the immigration minister. Mr McCallum's wife is ethnically Chinese, and he had a large Chinese-Canadian population in his former constituency in Ontario. Mr McCallum also served as Canada's defence minister in 2002-03. What's the latest on Meng Wanzhou's case? China's foreign ministry has urged US officials to withdraw the arrest order and refrain from moving ahead with the extradition request. Ms Meng's case has led to rising diplomatic tensions between Canada and China. Image caption Canadian nationals Michael Spavor (left) and Michael Kovrig have been put under "compulsory measures"
Two other Canadians - businessman Michael Spavor and former diplomat Michael Kovrg - were arrested following the detention of Ms Meng.